Immediately after Florida enacted comprehensive legislation on March 9 to restrict the sale of some firearms and gun-related accessories, the National Rifle Association filed suit to stop the law from taking effect. NRA executive Chris Cox says the NRA is “confident that the courts will vindicate our view that Florida’s ban is a blatant violation of the Second Amendment.” The skirmish raises the legal question: How far can states go to control firearms? The NRA suit in Florida represents the latest challenge by gun-rights advocates to the constitutionality of state and local laws. 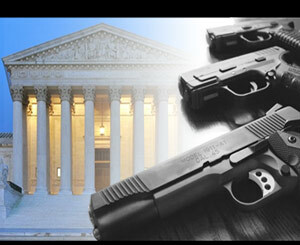 In 2008, the U.S. Supreme Court gave the gun-rights movement a historic victory, declaring by a 5-to-4 vote that the Second Amendment protects an individual’s right to have a firearm in one’s home. But since then, the Supreme Court has avoided the opportunity to define the parameters of that right. A decade ago, the late Justice Antonin Scalia wrote the majority opinion in District of Columbia v. Heller, which struck down the District’s gun law that barred ownership of a handgun in one’s home. The decision — and a similar 5-4 ruling in McDonald v. City of Chicago two years later — firmly established the constitutional right to keep a handgun at home throughout the United States. But both decisions left unsettled how far that right extends. “We do not read the Second Amendment to protect the right of citizens to carry arms for any sort of confrontation, just as we do not read the First Amendment to protect the right of citizens to speak for any purpose,” Scalia wrote in the Heller opinion. In that ruling, Scalia also pointed out that the decision should not be taken to “cast doubt on longstanding prohibitions on the possession of firearms” by felons and the mentally ill. Likewise, it did not affect laws forbidding firearms in sensitive places such as schools and government buildings. But, the Supreme Court has avoided taking up any significant local and state gun laws, including those that ban assault rifles or restrict who may carry a handgun outside the home. Instead, lower federal courts, in interpreting Heller, have generally upheld a broad range of gun law regulations while striking down some outlier laws that infringed on core Second Amendment rights. In recent months alone, for instance, the high court declined to hear several challenges pressed by gun-rights advocates. In November 2017, the Supreme Court declined hearing an appeal to a ruling by the U.S. Fourth Circuit Court of Appeals upholding a 2013 Maryland ban on assault weapons. On the same day, the court declined to review a Florida law that barred, except in certain situations, people from carrying firearms in public. Most recently, the court declined on Feb. 20 to hear a request from gun-rights activists to examine California’s 10-day waiting period for firearm sales. In a 14-page dissent in the California case, Justice Clarence Thomas criticized the Supreme Court’s string of refusals, saying the Second Amendment was “this court’s constitutional orphan.” He noted that the court has “not clarified the standard for assessing Second Amendment claims for almost 10” years, alluding to the Heller case. The new Florida law, signed less than a month after the Feb. 14 Marjory Stoneman Douglas High School shooting in Parkland that took the lives of 17 people, includes an array of gun limits that raises the minimum age to purchase a firearm to 21, extends the waiting period to three days and bans bump stocks, a rifle accessory that enables more rapid fire. Given that the suit was filed on March 9, it likely will take years before the litigation could reach the U.S. Supreme Court, if at all.